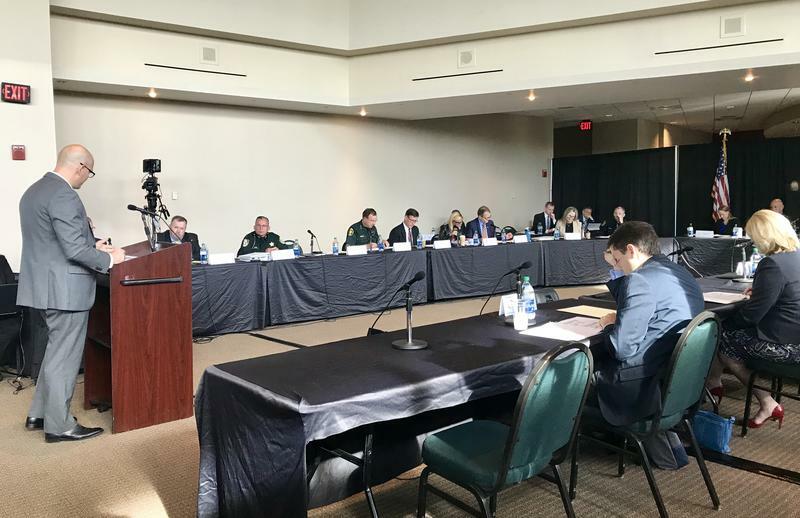 Major Brian Rafky, director of the Southeast Florida Fusion Center, left, presents to the commission about how state agencies share data. The commission subpoened Peterson to testify at its October meeting. In preparation for his testimony, members watched video tapes on Wednesday of the former deputy's reaction as the shooting occurred. Peterson was sitting by the door, Pinellas County Sheriff Bob Gualtieri said. "He could have gone in and just started shooting" and potentially killed the shooter, Nicolas Cruz. Gualtieri noted there were several instances when the shooter reloaded and was especially vulnerable. Peterson has been mostly silent since the shooting. He did appear on NBC's Today show in June to explain his actions, saying that he "never thought even for a moment about being scared." 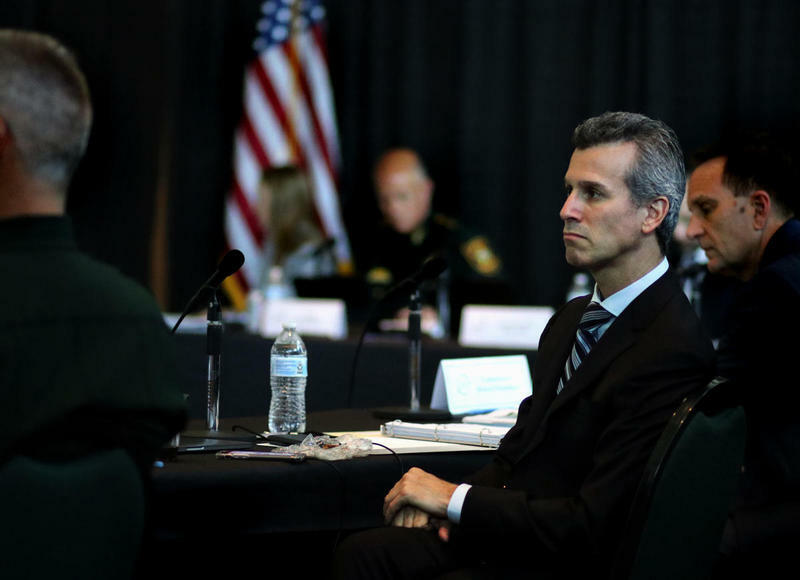 Parkland father Max Schachter, who lost his son Alex in the shooting, is on the commission. He said he has a number of questions to ask Peterson. "Why?" Schachter asked. "Why didn't he go in? He could have done something, why did he go away and hide? He could have saved those six kids' lives on the third floor." Gualtieri called Peterson's media appearances "self-serving." "He should answer. He volunteered...he went on the Today Show, he talked to the Washington Post. He should come here and answer questions from this fact-finding commission," he said. "We need to know what he did, what he didn't do - why he did it, why he didn't do it." Peterson is scheduled to appear at meetings on Oct. 10 and 11. If he fails to show up, the commission has the power to hold him in contempt of court. 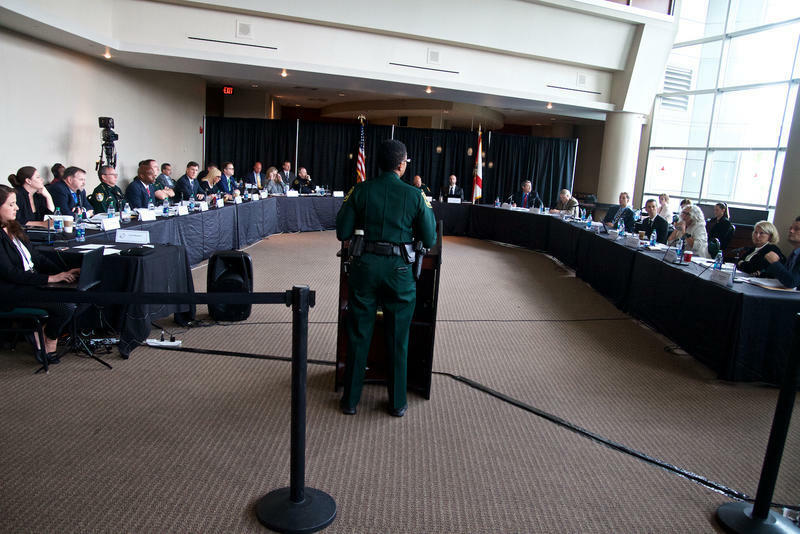 In addition to watching the videos, the comissioners discussed their recommendations for school resource officers and armed guards. They decided that all middle and high school campuses should always have at least one law enforcement officer present on campus. Elementary schools, however, can have an armed guardian instead of a police officer of Sheriff's deputy. Gualtieri said placing law enforcement officers at every elementary school is not possible. "There is not sufficient funding available to put a sworn law enforcment officer at all schools in the state," he said. "And even if that funding was available, there are not enough law enforcement officers in place now or that can be hired to accomplish that."